Join the discussion on our forums! 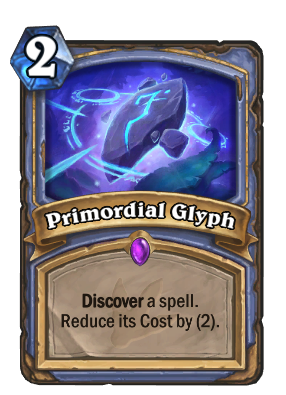 Come discuss Primordial Glyph over in our dedicated Primordial Glyph discussion topic. The Secrets discovered from Glyph should really be indicated in some way imo...okay, I can track the cards in my opponent's hand, but that's really not an option for ladder play. I'd be happy if Blizzard disabled this card's ability to discover Ice Block. Two patch later and still not nerfed? Send this card to hall of fame now please, or change the reduction to only 1 mana, 2 is broken. Turn 5 flamestrike against an aggro deck is gg, blizzard please. If you're playing an aggro deck like pirate warrior, you deserve a turn 5 Flamestrike. Well pirate warrior may be pirate warrior, and doesn't always deserve to win, but I still don't agree. The card is broken, an auto-include in every mage deck, broken in arena, needs nerf. I agree. With the addition of new spells to the game, the variety of options increases so you can get 3 very bad cards to pick from. Primordial Glyph: Discover a Pyroblast. The most broken spell in the game. Discover mechanic is okay but why there is also cost reduction? It is just stupid. "Eh, it will rotate out in 2019."